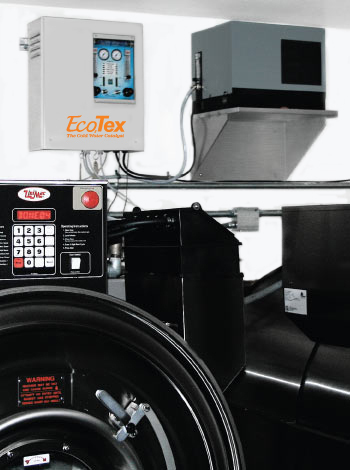 With the EcoTex diffusion system, ozone is continuously injected directly into the sump of the washer throughout each step of the wash cycle. Because it directly injects ozone into the washer sump, as opposed to the water supply, no additional pumps, contact vessels, filters, or piping is needed. This diffusion system delivers verified disinfection with improved laundry quality at the least cost compared to other design approaches. Disinfection is achieved not only in the ozone-enriched water but also in the direct contact between ozone gas and linen as they tumble together in the wash drum. It improves laundry performance by activating laundry detergents, reducing water usage, cutting the number of wash steps in the cycle, and virtually eliminating the need for hot water.